Hannah Baldwin (Canterbury, Connecticut, active 18th century), Bed Rug, 1741. Wool. Milwaukee Art Museum, Layton Art Collection, Purchase. When we last left off, Charlotte Partridge was the curator of the Layton Art Gallery, which was located on the northeast corner of North Jefferson street and Mason street. In 1957 the Layton Art Collection joined the Milwaukee Art Institute in the new War Memorial building. Three figures are key to the Layton Art Collection during this third period: Edward Dwight, Tracy Atkinson and Frederick Vogel III. Edward Dwight followed Partridge as curator of the Layton Art Collection and began turning the collecting focus from European paintings to American paintings. In 1962, Dwight left the Milwaukee Art Center (which at that point consisted of the Layton Art Collection and the Milwaukee Art Institute collection, and is now called the Milwaukee Art Museum) to become director of the Munson-Williams-Proctor Art Institute. Tracy Atkinson joined the staff, and Frederick Vogel became a Layton Trustee in 1965. Both Atkinson and Vogel continued collecting American art for the Layton Art Collection, focusing particularly on the decorative arts. This third section of the exhibition displays decorative arts masterworks from the Layton Art Collection. Instead of writing wall labels for the different pieces, Chipstone decided that it would be more interesting for visitors to hear the voice of the collector himself. We recorded Fred Vogel’s recollections about certain acquisitions, and afree audio guide with his “collector’s tour” is available inside the gallery. One of those early pieces is a 1741 bed rug, above. A bed rug is an elaborately woven object that was used in colonial America on a bed instead of a floor. 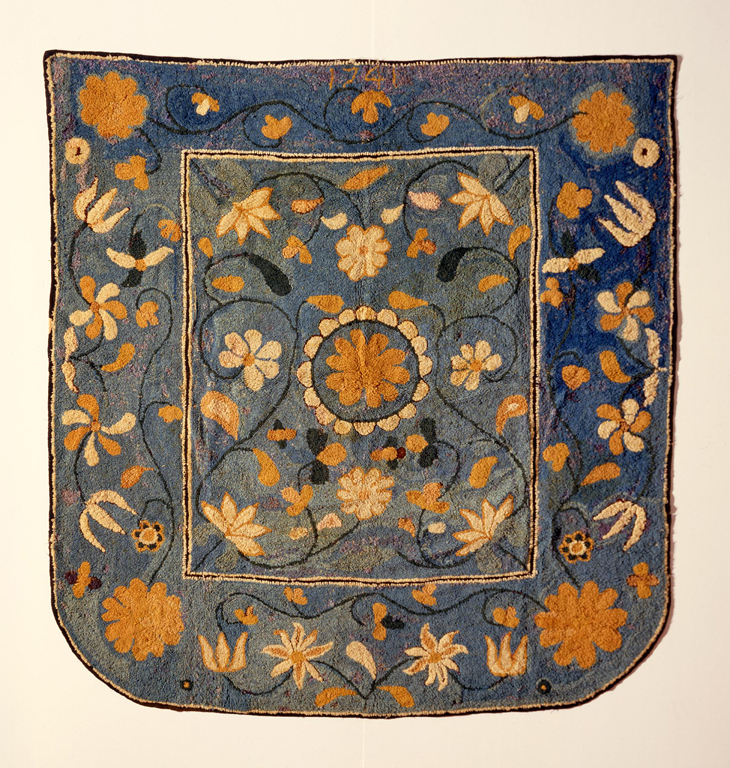 The one on display is one of the earliest surviving bed rugs. Vogel remembers first seeing the bed rug at an exhibition in the mid 1970s at the Wadsworth Athenaeum. He was so enthralled by the object that he found out who owned it and kept in contact in hopes it would one day be up for sale. When the bed rug finally appeared at Christie’s auction house, Vogel acquired it for the Layton Art Collection. Vogel was attracted by the date the bed rug was created, the originality of its woven composition, its condition, and its known maker (Hannah Baldwin). Another object on display with an interesting story is an exquisite inlaid desk and bookcase. 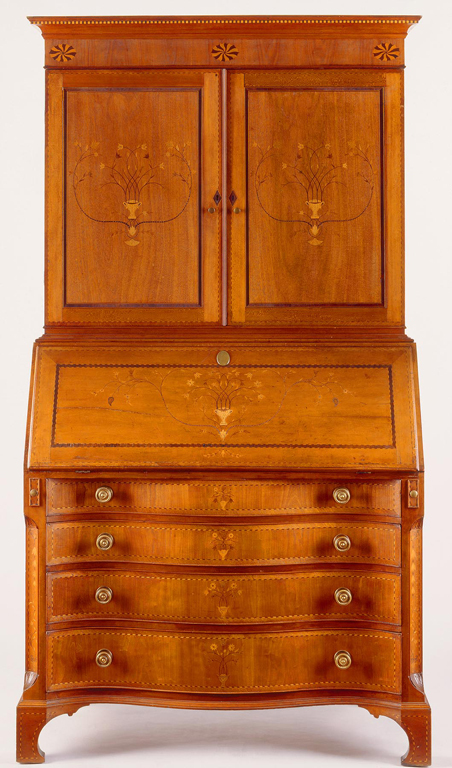 The maker was not known when it was acquired for the Layton Art Collection, so it was bought as a beautiful example of a Federal desk and bookcase. Its creator, Nathan Lombard, was discovered less than six months after it was acquired, and suddenly a whole body of similarly decorated material was attributed to Lombard’s shop. Soon thereafter, a Nathan Lombard tripod candle stand went up for auction and brought in three times as much money as the Layton Art Collection had paid for their desk and bookcase. Needless to say, this desk was a very good deal! I hope that you will come visit the Milwaukee Art Museum’s lower level and explore this last gallery in The Layton Art Collection: 1888-2013. Be sure to pick up the audio guide and listen to Vogel’s stories about the diverse objects. You may just begin thinking differently about why objects are important and about the kinds of objects you’ve acquired over time. This entry was posted in Art, Curatorial, Exhibitions and tagged Chipstone, Chipstone Foundation, history, Layton Art Collection, Layton Art Gallery, Milwaukee, Milwaukee history, Museum History, Vogel. Bookmark the permalink.